There are some memories from our childhood that linger faded and fragmented in our subconscious. One such memory of mine is the one-time broadcast of the film The Lathe of Heaven that aired nationally on PBS stations Wednesday, January 9, 1980, featuring Bruce Davison as the protagonist George Orr, Kevin Conway as the antagonist Dr. William Haber, and Margaret Avery as Orr’s lawyer and love interest Heather LeLache. The film is available above from the Aeolus 13 Umbra YouTube channel. 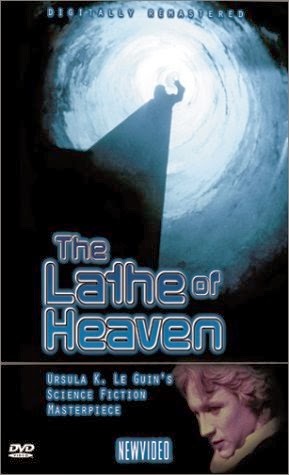 The Lathe of Heaven, a 1971 novel by Ursula K. Le Guin, and winner of the Nebula Award (1971) and the Hugo Award (1972), is ostensibly about a man whose dreams can change reality, but it really deals with the conflict between the Eastern and Western philosophical outlooks. The title of the book is a reference to the human mind, which, like a lathe, carves a design — one out of wood, the other out of reality. In 1980 I was fifteen years old, and I admit the material was above my head at the time; however, the imagery of the film and basic concept — that we create our own realities — remained with me a long time after I forgot the title of film. It was within the folds of a sci-fi film catalog that I rediscovered it, and a lost part of my youth. As opposed to today’s special effects driven sci-fi, The Lathe of Heaven is representative of pre-Star Wars sci-fi that was more intellectual and contemplative in nature. It blends social commentary and philosophy built on an basic conflict of characters with opposing outlooks on life. 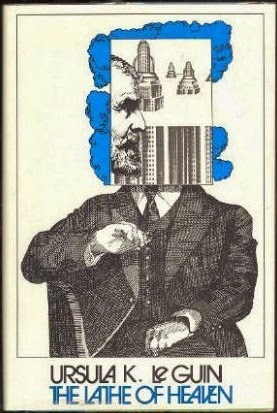 The novel was released in the early 1970s when a whole generation of young people embraced the alternate outlook on life Eastern philosophies provided. Indeed, the image of a long-haired hippie sitting in the lotus position and chanting ancient Asian proverbs became so common in our culture it has since become a stereotype. The passage is mistranslated because China did not have lathes at the time Chuang Tzu was alive, as Le Guin herself concedes in an interview with Bill Moyers that accompanied the DVD release of the 1980 film version (see below). Nevertheless, it remains a compelling thought in that it asserts that there are limits to our reality that cannot be surpassed, and wisdom comes with that realization. In the novel, protagonist George Orr has the power to dream new realities into being. It is a power he fears, for in every new reality he dreams up George finds himself as much a pawn as anyone else. He seeks help from Dr. Haber, who manipulates George into dreaming up solutions to the world’s problems, such as overpopulation, global conflicts, and racial prejudice, as well as riches and fame for the good doctor. The solutions, however, are imperfect for they are drawn from deep inside George Orr’s subconscious — his fears and nightmares. The cure for overpopulation is a global pandemic that wipes out six billion humans. The answer to global conflicts is to unite the world against a common enemy, which manifests itself as a classic alien invasion. The solution to racial prejudice is simple — everyone's skin turns gray. Dr. Haber: You have a great gift George. Together, we can learn to use it. George Orr: You can’t use my dreams to change things. Haven’t you learned that yet? Dr. Haber: Isn’t that the purpose of man on Earth? To act? To change things? To run things? To build a better world? George Orr: I don’t know . . . I don’t know. Things don’t have purposes. I don’t know if life has a purpose. I can’t say that it matters. It is. We are. I want to stop. Dr. Haber: George, I know that I can learn to harness your power, but you must give me time. George Orr: It’s no use. We haven’t got the right. Dr. Haber: We have a duty! Why do you resist? Why do you fear your own power? George Orr: Because it doesn’t work! You change one thing and everything changes! The plague didn’t solve anything. We’re closer to war now than we ever have been. I can’t let you use me anymore. Dr. Haber: George . . . you need me George, you know that. Without me, you’re out of control. The conflict between George Orr and Dr. Haber also represents the conflict between utopia and dystopia, an idea I explore in my essay, Dystopia and 20th Century Science Fiction Film, which asserts that the two concepts, utopia and dystopia, can never fully be realized for both are interdependent. The very act of striving towards one repels us towards the other. The best we can hope for is a balance between the two, as it also is with Eastern and Western concepts of philosophical truth. When the answers are so divergent, the solution is often somewhere in-between. Prior to the 2000 DVD/VHS release, The Lathe of Heaven had not been released on video nor had it been rebroadcast on television since that January day in 1980. The film is a look into a period of time in science fiction and in our culture — when thoughts were deep, and the sci-fi even deeper. Great article here. I, like the writer here was captivated by this movie. When first broadcast I was a mere 24 yrs. old. I was lucky enough to have, and still have the VHS Tape I recorded that night. Watch it every so often and didn't have to wait for the DVD all those years. I showed it to my sons but only recommend it to a very few special people I know will appreciate it. It's not for everyone, but that's too bad for them! Your sons are lucky to have been exposed to it and the concepts in the film!